Many ancient accounts ascribe volcanic eruptions to supernatural causes, such as the actions of gods or demigods. To the ancient Greeks, volcanoes' capricious power could only be explained as acts of the gods, while 16th/17th-century German astronomer Johannes Kepler believed they were ducts for the Earth's tears. One early idea counter to this was proposed by Jesuit Athanasius Kircher (1602-1680), who witnessed eruptions of Mount Etna and Stromboli, then visited the crater of Vesuvius and published his view of an Earth with a central fire connected to numerous others caused by the burning of sulfur, bitumen and coal. The word 'volcano' comes from the little island of Vulcano in the Mediterranean Sea off Sicily. Centuries ago, the people living in this area believed that Vulcano was the chimney of the forge of Vulcan - the blacksmith of the Roman gods. 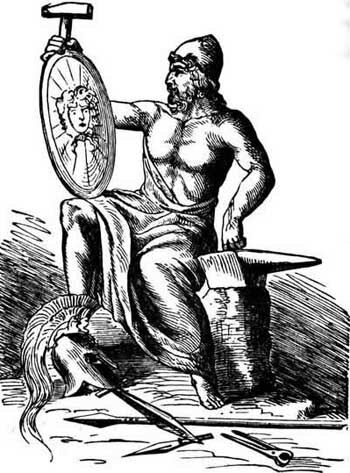 They thought that the hot lava fragments and clouds of dust erupting form Vulcano came from Vulcan's forge as he beat out thunderbolts for Jupiter, king of the gods, and weapons for Mars, the god of war. In Roman mythology, Vulcan, the god of fire, was said to have made tools and weapons for the other gods in his workshop at Olympus. Throughout history, volcanoes have frequently been identified with Vulcan and other mythological figures. Scientists now know that the "smoke" from volcanoes, once attributed by poets to be from Vulcan's forge, is actually volcanic gas naturally released from both active and many inactive volcanoes. Volcan was Hephaistos - the Greek god of fire and craftsmanship, named Vulcan by the Romans. He was the son of Zeus and Hera - although some versions of his story state that he had no father, with Hera bearing him alone in retaliation for Zeus having brought forth Athena - Hephaestus was born lame and ugly, and his mother Hera hated him on first sight. In one version of the myth, Hera herself, after seeing that he was born deformed, casts him from Olympus. In another version Zeus hurls him from heaven because he tried to defend Hera when they were having a quarrel. Upon landing on Lemnos - after falling for a full day - Hephaestus brakes his legs and becomes lame. In any case, the sea-goddess Thetis then finds the crippled infant on the beach, and takes him to her underwater grotto where she raises him with the help of Eurynome, mother of the Graces. To regain his rightful place among the gods, Hephaestus used a clever ruse. He built a golden throne and sent it to Hera as a gift. Upon sitting on it, Hera got imprisoned by its golden arms, which promptly clamped her. To reclaim her freedom Hera had to extract a promise from all the gods that Hephaestus would be accepted into the Pantheon. 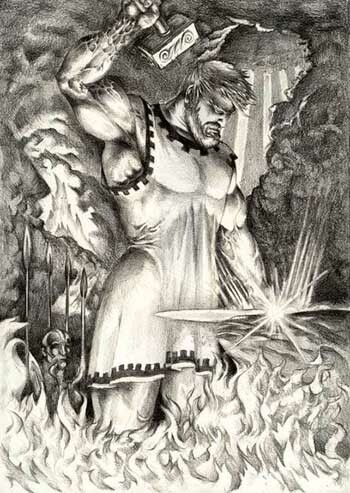 Hephaestus became the smith and manufacturer of art, arms and armor for gods and heroes, using a volcano as his forge. According to the Iliad he is married to Aglaia, one of the Graces, but in the Odyssey he is said to be married to Aphrodite. Allegedly it all started with a volcanic eruption. A popular theory holds that the Thera eruption is the source of the legend of Atlantis. 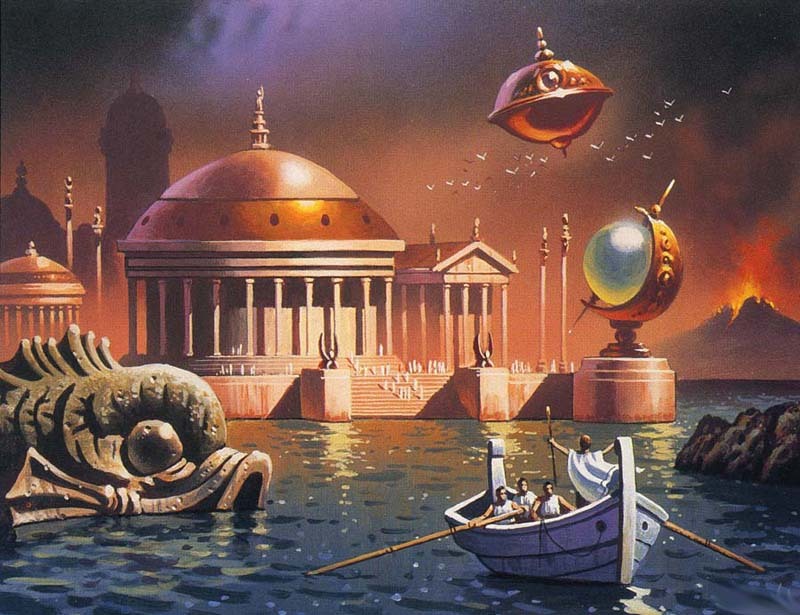 Atlantis - the story about a prosperous land that disappeared without trace, sunk into the sea by the anger of gods - has been one of the oldest myths of mankind. 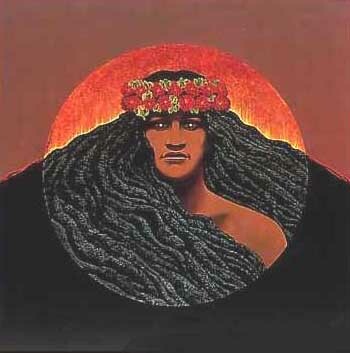 Hawaiian legends tell that eruptions were caused by Pele, the beautiful but tempestuous Goddess of Volcanoes, during her frequent moments of anger. Pele was both revered and feared; her immense power and many adventures figured prominently in ancient Hawaiian songs and chants. She could cause earthquakes by stamping her feet and volcanic eruptions and fiery devastations by digging with the Pa'oe, her magic stick. An oft-told legend describes the long and bitter quarrel between Pele and her older sister Namakaokahai that led to the creation of the chain of volcanoes that form the islands. Kilauea volcano, on the south side of the Island of Hawaii, is one of the most active on Earth. It sits on the southeasten side of the Big Island of Hawaii, resting on the flanks of it's larger neighbor volcano Manua Loa. Kilauea stands just under 4,200 feet tall at it's highest point. Kilauea is the home to Pele, the volcano goddess of ancient Hawaiian legends. 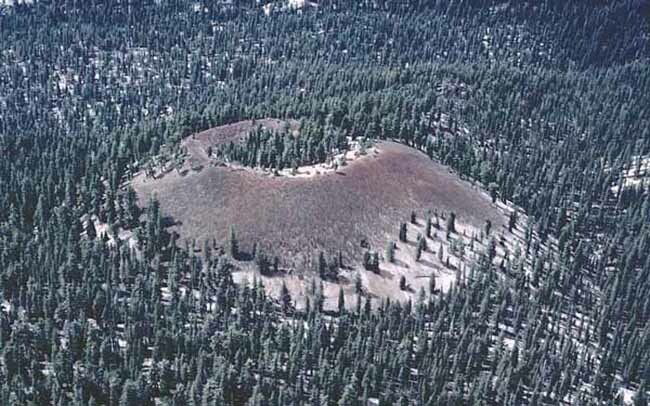 Fiery avalanches sometimes interrupted the lives of Native Americans near Mount Mazama - (pre-Crater Lake volcano) -- more than 6,000 years ago. These people interpreted Mazama's violent eruptions before its collapse as a war between two gods, Llao and Skell. Indeed, archeological evidence suggests that human beings witnessed this cataclysmic event. Shamans in historic time forbade most Indians to view the lake, and the Indians offered no information about the lake to pioneers who crisscrossed the area for 50 years without discovering it. According to Indian legend, La-o was the chief spirit who occupied the mystic land of Gaywas, or Crater Lake. Under his control were many lesser spirits, who appeared to be able to change their forms at will. Many of them were monsters of various kinds. Among them the giant crawfish (or dragon) who could, if he chose, reach up his mighty arms even to the tops of the cliffs and drag down to the cold depths of Crater Lake, any too venturesome tourists of the Primal days. The spirits of beings under the control of La-o assumed the form of many animals of the present day, when they chose to go abroad on the land, and this was no less true of the other fabulous inhabitants of Klamath land, who were dominated by other chief spirits, and who occupied separate localities. Skell was a mighty spirit whose realm was the Klamath Marsh region, his capital being near the Yamsay River on the eastern side of the marsh. He had many subjects who took the form of birds and beasts when abroad in the land, as the antelope, the bald eagle, the golden eagle and others, among which were the most sagacious and active creatures on earth. Now a fierce war occurred between Skell and La-o and their followers, which raged for a long time. Finally, Skell was stricken down in his own land of Yamsay and his heart was torn from his body and carried in triumph to La-o Yaina or La-o's mountain, the eastern escapement of which is the great rock rising above Crater Lake. A smooth field sloping to the north was a favorite playground for the fabled inhabitants of Gaywas and all the neighboring communities. Hither all the people were summoned for a great celebration of the fall of Skell. Even the followers of Skell were invited. In the course of the festival, the heart of Skell was tossed from hand to hand in a great game of ball. The men of Skell knew that if the heart of Skell could be restored to his body he would live again, and with a secret understanding between them, they awaited their opportunity. Finally when it reached the hands of Antelope, he sped eastward swift as the wind. When nearly exhausted, he passed it to the Bald Eagle and he in turn to the Golden Eagle, and so on, and altho the men of La-o pursued with utmost speed, they failed to overtake the swift bearers of the precious heart. At last they heard the far away voice of the dove, another of Skell's people, and they then gave up the useless pursuit. Skell's heart was returned to his body, he lived again and the ware was resumed. La-o was himself overpowered and slain. His body was borne in triumph to the great rock, the cliff overlooking the lake near his own capital. A false message was conveyed to La-o's monsters in the lake that Skell had been killed again. The body was torn to pieces and hurled into the water. As each part of the body was thrown to the lake, the monsters of La-o devoured it. But when the head was thrown in, they recognized it as that of their own god La-o, and refused to touch it. So it remains today as an island known to all as Wizard Island. Two great cliffs facing each other across the Lake have been given the names Llao Rock, and Skell's Head by William G. Steel, "Father" of Crater Lake National Park. 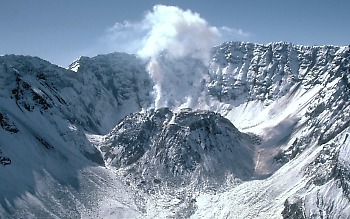 Northwest Indians told early explorers about the firey Mount St. Helens. In fact, an Indian name for the mountain, Louwala-Clough, means "smoking mountain". According to one legend, the mountain was once a beautiful maiden, "Loowit". 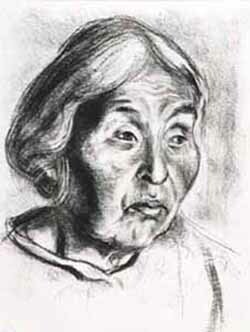 When two sons of the Great Spirit "Sahale" fell in love with her, she could not choose between them. The two braves, Wyeast and Klickitat fought over her, burning villages and forests in the process. Sahale was furious. He smote the three lovers and erected a mighty mountain peak where each fell. 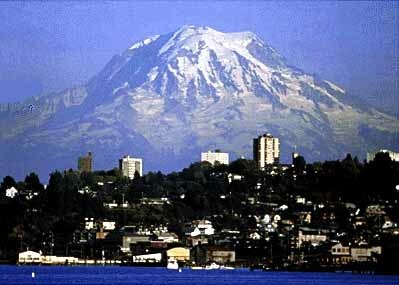 Because Loowit was beautiful, her mountain (Mount St. Helens) was a beautiful, symmetrical cone of dazzling white. Wyeast (Mount Hood) lifts his head in pride, but Klickitat (Mount Adams) wept to see the beautiful maiden wrapped in snow, so he bends his head as he gazes on St. Helens. Native American legends abound with descriptions of the brothers Wy'east (Hood) and Pahto (Adams) battling for the fair La-wa-la-clough (St. Helens). Behaviors attributed to Wy'east include hurtling of hot rocks from gaping holes, sending forth streams of liquid fire, loss of formerly high summits, and choking of valleys with rocks. These are fair descriptions of Mount Hood's reconstructed activity over the past two millennia. Northwest American Indians knew the mountain long before European explorers reached the waters of the Pacific Ocean. For generations, they knew the mountain as Takhoma, Tahoma, Ta-co-bet, and several other names. The names mean "big mountain", "snowy peak", or "place where the waters begin". Little Tahoma is the name of a prominent rock outcrop on the eastside of Mount Rainier. Comes the orca whale in winter, with the news of our Saviour's coming. The orca says when the Pacific waters are at their coldest, when the winter sun shines like water, a mountain that men call The Mammoth will explode and hurl smoke and flame miles into the sky. The mountains will bloom with fire, by and by, but very soon, before the winter snows melt and the orcas go back to the open sea. A doctor with a foreign name will use plants like the 'Forget-Me-Not' to make cures for many diseases. Cancer and the flu will never kill people again. A wasting disease (AIDS) that first strikes at men who love other men, will be cured at last. Russia will return to Communism and more than 20 million people will die in concentration camps as democracy is purged. Statues of Stalin will once again be raised all over the nation and the specter of nuclear war will again haunt the earth. In the hours before Jesus returns to Earth, the whole world will smell of roses. The orca said the Lord will do this so men will know the time has come. That day is coming very soon.